Which Sweet 16 teams feel the pressure? A Sweet 16 appearance elevates a program to the next level. A Final Four moves it up another notch. The matchups usually make the difference in getting this far. Talent -- and star power -- also play big roles. There is a certain level of pressure for all coaches and programs. For some, it's self-induced. For others, it comes from a passionate fan base. Some programs need to reach the Final Four for the season to be considered a success. Some do not. Baylor (5): The men's team doesn't need to make a Final Four appearance. The women will take care of that, as they are the favorites to win the national title. But the men's team has the makeup to make this run a rare one. Few teams have length like the Bears do, and it's unlikely that Perry Jones III will stick around for a third season. The reason Baylor doesn't have as much pressure to reach the Final Four, even though it has the personnel to make it to New Orleans, is the bracket it's in. Kentucky could stand in the way of Baylor's potential first men's Final Four appearance. The Wildcats are the clear favorites, so expecting the Bears to advance to the Final Four from the South wouldn't be fair. Cincinnati (3): Cincinnati has survived suspensions and a bumpy ride in the Big East. The Bearcats thrived at the end of the season and reached the conference title game. Mick Cronin and this crew have exceeded expectations by reaching the Sweet 16. Playing one of the favorites in Ohio State takes more pressure off the Bearcats. This ride now is all about extra credit for Cronin and Co.
Florida (4): The Gators won two national titles in consecutive seasons. It will be hard for any program to duplicate that -- ever again. Keeping a team together like the '04 class for the '06 and '07 titles will be extremely difficult to match unless the NBA draft rules change again. The Gators had an easier road to the Sweet 16 thanks to a depleted Virginia team and playing Norfolk State, which exhausted itself with the stunning upset over Missouri. But the Gators don't need to get to the Final Four. If Florida does reach New Orleans with this flawed group and its suspect inside game, it would be quite a feat. The Gators are the lowest remaining seed in the West, too. Expecting them to get past Marquette and possibly top seed Michigan State would be a bit much. Indiana (3): Tom Crean has turned the corner in Bloomington. There was legitimate reason to be concerned last season. But Crean recruited exceptionally well, getting a star in Cody Zeller, and he got his players to believe they could win big-time games. The victory over Kentucky will resonate for some time. Reaching the Sweet 16 gives Crean even more credibility and respect in the state. However, for this team to get past Kentucky would be asking too much. No one should expect a win over the Wildcats again. To advance to the Elite Eight and the Final Four would be sensational accomplishments. Even though the fan base expects greatness, Indiana has already exceeded any expectations by getting this far. Louisville (5): The Cardinals are the "pro" team in town. And like Kentucky, the expectations include Final Four appearances. But Louisville has gone through a slew of injuries, and there was no reason to believe it could maintain a high level of play throughout the season. Still, the Cards survived to reach the Sweet 16 and face top-seeded Michigan State. The most pressure may be felt in trying to keep up with rival Kentucky. The expectation is that the Wildcats will be in the Final Four, so why not join them and create even more frenzy in a hoops-crazed state? 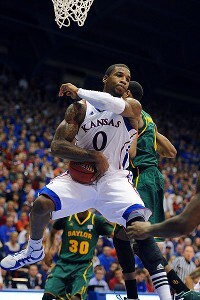 Kansas (9): The Jayhawks have two of the top players at their positions in Thomas Robinson and Tyshawn Taylor. Kansas expects to compete for conference and national titles, regardless of personnel, every season. And while Bill Self had to deal with rotation players not being eligible, including top newcomer Ben McLemore, the Jayhawks still won the Big 12 regular-season title for the eighth straight time. Kansas survived against Purdue, but had it not been for a guard meltdown the Jayhawks may be idle right now. Instead, they have new life in the Midwest, thanks to NC State's Sweet 16 run and North Carolina potentially being without Kendall Marshall in the Elite Eight (if the Tar Heels get past Ohio). The pressure has ratcheted up for the Jayhawks. If Marshall is out for this weekend in St. Louis, the Jayhawks are the new favorites in the Midwest. Kentucky (10): The Wildcats are the front-runners to win the national title, not just get to the Final Four. Let's be honest, anything less than a title would be a disappointment. No team in the Sweet 16 has as much pressure to get to the Final Four as Kentucky. The Wildcats have the most talent, the national player of the year in Anthony Davis, and plenty of other pro talent on the roster (Michael Kidd-Gilchrist, Terrence Jones and Doron Lamb). Darius Miller also played in the Final Four last season. John Calipari has coached in three Final Fours. The Wildcats are playing a team that handed them their only regular-season loss. A possible matchup with Baylor is more than formidable. The Bears can match Kentucky's length and shooting, but Baylor's defense has never been its strong suit. The region still lays out well for Kentucky in SEC-rich Catlanta. Marquette (6): The Golden Eagles play as hard, if not harder, than any other team in the field. Marquette's beat down of BYU in the second half and its ability to run past Murray State late were quite impressive. Now, the Eagles get a Florida team that it matches up well with since they can defend the 3-point shot. Marquette should be the favorite in this game and has the personnel and the toughness to beat Michigan State or Louisville. A Final Four isn't expected with this group, but now the bracket has opened up a bit with Missouri gone. A loss in the Elite Eight makes more sense, but there is some pressure for Marquette to advance with Jae Crowder and Darius Johnson-Odom leading the way. The Eagles have been to a Final Four with Dwyane Wade under Crean. A berth for Buzz Williams would raise his coaching profile. Michigan State (8): The Spartans lost one of their key rotation players in Branden Dawson in the final regular-season game against Ohio State. But they won the Big Ten tournament title without him and earned a No. 1 seed in the NCAAs. Draymond Green has been the most valuable player so far in the NCAA tournament and has a legit shot to lead the Spartans to another Final Four. Michigan State expects Final Fours under Tom Izzo, but this team certainly didn't look the part early in the season. It has matured into a title contender. And while the bracket is filled with potential hurdles, the Spartans have the pressure of being a top seed and the expectation of a Final Four appearance. North Carolina (8): The Tar Heels would have had a 10 in this spot if Marshall didn't fracture his wrist against Creighton and have surgery on Monday. Now, the pressure of reaching the Final Four has dropped a few spots. North Carolina was as healthy as it had been in weeks at the start of the game with the Bluejays. But the Marshall injury makes the Tar Heels extremely vulnerable. Ohio is capable of pulling off another upset. And if the Tar Heels get past Ohio, a revenge-minded NC State team or title-contending Kansas awaits. The Tar Heels were built to win a title. That's why Harrison Barnes didn't opt for the NBA. Tyler Zeller had opportunities, as well. The roster is deep enough to absorb injuries to Leslie McDonald and Dexter Strickland. Let's see if it can take its worst hit and survive without Marshall or having him only on a limited basis. The expectations for a Final Four may have dropped outside of Chapel Hill, but it hasn't inside the Dean Smith Center. Carolina should expect to be in the Final Four yet again. It's just tougher with Marshall's injury and Kansas potentially looming. NC State (2): The Wolfpack have far exceeded expectations under Mark Gottfried. NC State was the last team revealed on Selection Sunday. It had to be one of the last teams in the field prior to the four at-large teams that played in the First Four. NC State lost a 19-point lead at Duke, and the Wolfpack couldn't close out UNC in the ACC tournament. But they grinded out wins over San Diego State and Georgetown in their first two games of the tournament. This program has had low expectations for years. The Final Four would be gravy on what has already been deemed a highly successful season. The Wolfpack draw Kansas and if they somehow get past KU (not improbable), they could face a rematch with UNC. One can only imagine the scene in Raleigh if NC State, and not UNC, made the Final Four. Ohio (1): The Bobcats are one of the tournament's great stories. Ohio played one of the more dramatic conference tournament title games when it knocked off Akron in thrilling fashion. The Bobcats got a decent seed at 13 and were matched up against a flawed Michigan squad. Ohio was aggressive and had the more experienced lead guard in D.J. 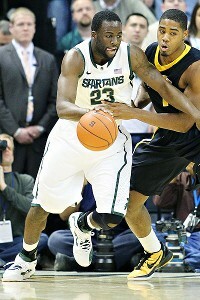 Cooper (vs. the heralded Trey Burke) against the Wolverines. The Bobcats then faced a 12-seed in South Florida that couldn't score and was playing its third game of the tournament. Now, Ohio is playing with house money. The Bobcats have zero pressure in reaching the Final Four. Sure, they are facing a North Carolina team that will likely be sans Marshall. But to expect Ohio to win two more and get to the Final Four would be unfair. Ohio has already made its mark with this Sweet 16 appearance and coach John Groce can likely write his own ticket to a higher-paying job in the Big Ten if he chooses to do so. Ohio State (9): The Buckeyes would have been a 1-seed if they had beaten Michigan State in the Big Ten title game. Jared Sullinger is healthy again, and the personnel hasn't changed. The Buckeyes possess some of the top players at their respective positions in Aaron Craft (top on-ball defender), William Buford (elite shooter) and Deshaun Thomas (a tough matchup as a face-up forward). Ohio State drew an instate rival in Cincinnati. The Bearcats will muck up the game and challenge everything. The top part of the bracket would be just as difficult with either a lock-down defensive team in Wisconsin or an up-and-down transition squad with a pesky zone in top seed Syracuse. But the Orange don't have Fab Melo, so if you were to re-rank the East bracket, the Buckeyes would have to be the favorites. That puts more pressure on Ohio State, and with Sullinger possibly leaving for the NBA, the window to reach the Final Four is now. Syracuse (9): The Orange were built for a Final Four run. No team had players coming off the bench like Dion Waiters, C.J. Fair and Michael Carter-Williams. Fair is starting now, but the overall depth is still impressive. Melo's ineligibility knocks the Orange down from a 10. The expectation was Final Four or bust since they started showing their dominance during the Big East season. Syracuse has tremendous versatility with Scoop Jardine, Brandon Triche and Kris Joseph all able to make key shots. The Orange weren't tested by Kansas State after surviving a scare from UNC Asheville. The expectation is that it should beat Wisconsin and play against Ohio State. Syracuse may not be projected to beat the Buckeyes in a possible Elite Eight matchup now, sans Melo, but the pressure is there to get to a Final Four with a group that won't be together next season. Wisconsin (4): Bo Ryan has never reached the Final Four. But he has had better teams projected to go farther. This squad has improved more than any of the previous teams he's coached at Wisconsin. The Badgers lost three early-season home games, and that rattled their confidence. But it didn't take away their resolve. Wisconsin found its shooting stroke, maintained its defensive intensity and got star-level play out of a role player in Ryan Evans. Jordan Taylor is still the leader and will take -- and make -- the big shots. The Badgers were the more polished team in wins over Montana and Vanderbilt. The expectation to knock off Syracuse isn't high. But if that occurs, then a team they already beat -- Ohio State -- could be standing in their way. The Badgers' last Final Four appearance was in 2000. The fan base is hungry for another run, but it doesn't need one. Ryan would like one, but he knows this may not be his best shot. Still, it's plausible in the current bracket. Xavier (3): The Musketeers may not have been here had it not been for an A-10 title game appearance. Xavier had to mount a season-long repair project to get to this point. And it worked. Coach Chris Mack deserves as much credit for this run as the criticism he took for the way he initially handled the post-brawl situation. He matured as a coach during the season, dealt with his own knee injury and clearly got his lead guards, notably Tu Holloway, to refocus on the task at hand. Xavier survived Notre Dame by playing smarter than the Irish. It showed more moxie than Lehigh in finishing with a strong kick. No one is expecting Xavier to make the Final Four, even those that projected the Musketeers to do so in November. But Baylor is beatable. Taking down Kentucky would be quite a feat. The pressure is low. Xavier has already exceeded the expectations of a team that once had Final Four aspirations but didn't play that way for most of the Atlantic 10 season. Now that it's two wins away, the pressure is even lower. Xavier has already done well to finish the season on a high. Peter G. Aiken/US Presswire Creighton's Doug McDermott has been one of the most complete players in the nation.